Vindictive Pakistani judges' relentless pursuit of Musharraf continues with an FIR ordered against the former president for Lal Masjid operation conducted in 2007. Nawaz Sharif government is working with Sindh provincial administration to carry out "targeted" operations by rangers and police against criminal gangs extorting money from businesses and killing innocent citizens of Karachi. United States is pushing for military action against Syrian dictator Bashar Al-Assad for alleged use of chemical weapons by his forces. Islamabad High Court Judge Noor-ul-Haq Qureshi ordered a local police official in the nation's capital to register a criminal case against President Musharraf for Lal Masjid operation back in 2007. The judge threatened to hold the reluctant police officer in contempt unless he registered an FIR against the former president, forcing the poor officer to do so against his considered and lawful judgement. The forced registration of an FIR against a former president in Lal Masjid case sends a very alarming message to the current and future government executives including presidents and prime ministers of Pakistan: "Don't mess with anyone who takes up arms to challenge state's writ in the name of Islam and the Shariah Law. If you do, you will be dragged into courts headed by right-wing Islamist judges who sympathize with the Shariah vigilantes". Most of the Islamabad judges are from the Rawalpindi Bar Association which has the strongest right-wing Islamist connections in the country. 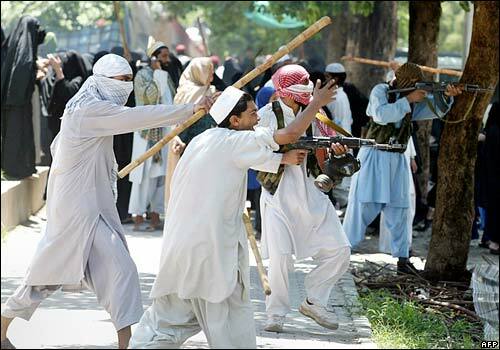 Its members treated Punjab Gov Salman Taseer's killer Mumtaz Qadri as a hero and showered him with rose petals. Justice Shaukat Aziz Siddiqui of Islamabad High Court was a Jamaat-e-Islami candidate in 2002 elections. He has represented former Lal Masjid Imam Maulana Abul Aziz who led Lal Masjid vigilantes in defying the writ of the state to enforce his version of the Shariah law in the hear of Pakistan's capital Islamabad. In April this year, Justice Shaukat Aziz Siddiqui ordered former President Pervez Musharraf's arrest by revoking bail that was properly granted earlier by Justice Mushir Alam, a Sindh High Court judge in Karachi. Although Judge Siddiqui has recused himself from Lal Masjid case, the fact is that other judges of the Islamabad High Court are activists with similar views as right-wing ideologues. Qureshi's biography on Islamabad High Court website describes him as "having dynasty of well esteemed Siddiqui Qureshi clan migrated to Sindh with Ghazi Muhammad Bin Qasim." The appointments of both judges were confirmed by former President Zardari under the threat of contempt of court by Pakistan Supreme Court judges. Karachi is often called the urban frontier. It is also a goose that lays golden eggs; its businesses are forced to part with an estimated Rs. 830 million every day in extortion money (bhatta) to criminal gangs and terrorists of various kinds operating in the megacity of 20 million residents. The problem is that, in spite of such vast amounts of protection money, the businessmen are feeling more unsafe than ever; they are being kidnapped, tortured and killed by multiplicity of ever-greedier extortionists with growing appetite for money and violence. Could this excessive greed kill the goose that lays golden eggs? Nawaz Sharif government is in the midst of yet another law-enforcement operation by police and rangers against criminal gangs in Karachi. It has the same problem as the myriad operations before it; Most criminals and gangsters are affiliated with Karachi's powerful politicians who spring them lose after they are arrested by rangers and handed over to the police. 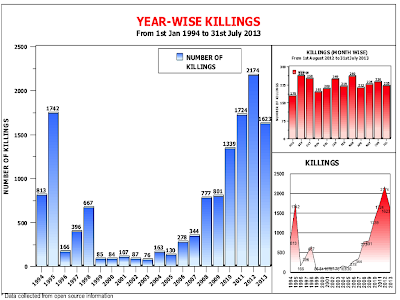 Karachi's past history tells us that violence goes down significantly when it is run by an elected local government. In recent history, the quietest years have been the years when an MQM-led duly elected local government has been put in charge of running Karachi. Nawaz Sharif should try this as well: Ensure local elections and allow an empowered local government with police powers to tackle its crime problems. If it fails, then Martial Law under governor's rule should be considered to clean up Karachi. There have been recent headlines triggered by the threat of the Obama administration to punish Syrian dictator Bashar Al-Assad for his alleged use of chemical weapons against civilians near Damascus. This needs to be seen in the context of a major humanitarian disaster that started to unfold when, as part of the Arab Spring elsewhere in the Middle East, ordinary Syrians rose up against the Assad dynasty's dictatorial rule over a period of 43 years. Taking a page from his father's playbook in Hama where thousands were killed by Hafez Al-Assad for defying him, Bashar responded with brute force to suppress a peaceful protest movement against his repressive rule. This time, the Hama formula backfired on Assad as the Opposition took up arms with foreign help to fight the regime. It's now a major humanitarian crisis in which over 100,000 Syrians have been killed so far in a population of only about 22 million, several hundred thousand have been injured and disabled and millions have been uprooted from their homes and forced to live in refugee camps in Syria, Jordan, Turkey, Lebanon and Iraq. 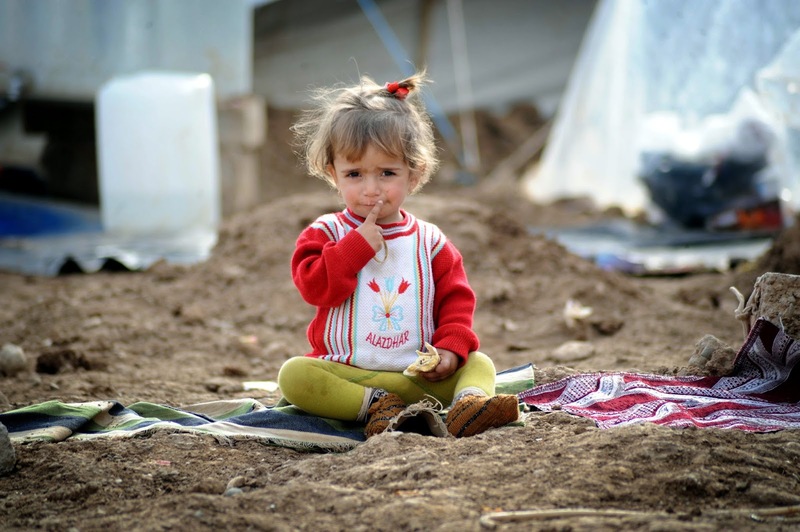 Will the US strikes against Assad help resolve the Syrian humanitarian crisis? The answer is NO. Viewpoint from Overseas host Faraz Darvesh discusses with Riaz Haq, Sabahat Ashraf, and Ali Hasan Cemendtaur new cases against Pervez Musharraf; the upcoming Karachi operation to arrest terrorists and criminal elements; and what benefit would a US attack on Syria have. This show was recorded at 1 pm PST on Thursday, September 5, 2013. New cases against Musharraf; Karachi operation; US ready to attack Syria from WBT TV on Vimeo. Is Musharraf's High Treason Trial Justified? Mr. Hussain fled to London in 1992, when the movement was engaged in a vicious street battle with the central government for supremacy in Karachi. The British government granted him political asylum and, 10 years later, a British passport. London has long been the antechamber of Pakistani politics, where self-exiled leaders take refuge until they can return. The former military ruler Pervez Musharraf lived here until recently, and the current prime minister, Nawaz Sharif, lived here until 2007. Mr. Hussain, however, shows no sign of going back. The Muttahida Qaumi Movement has an office in Edgware, in northwest London. But these days Mr. Hussain is mostly at home, in a redbrick suburban house protected by raised walls, security cameras and a contingent of former British soldiers he has hired as bodyguards. From there, he holds court, addressing his faraway followers in a vigorous, sometimes maniacal style, punctuated by jabbing gestures and hectoring outbursts. Occasionally he bursts into song, or tears. Yet, on the other end of the line, it is not unusual to find tens of thousands of people crowded into a Karachi street, listening raptly before an empty stage containing Mr. Hussain’s portrait, as his disembodied voice booms from speakers. In Karachi, his overwhelmingly middle-class party is fronted by sharply dressed, well-spoken men — and a good number of women — and it has won a reputation for efficient city administration. But beneath the surface, its mandate is backed by armed gangs involved in racketeering, abduction and the targeted killings of ethnic and political rivals, the police and diplomats say. Other major Pakistani parties indulge in similar behavior, but the Muttahida Qaumi Movement frequently brings the most muscle to the fight. 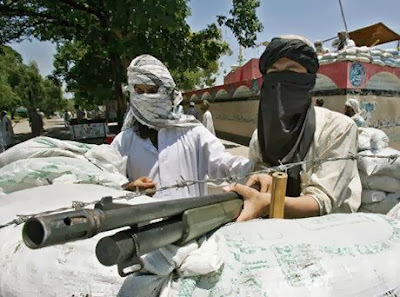 An American diplomatic cable from 2008 titled “Gangs of Karachi,” which was published by WikiLeaks, cited estimatesthat the party had an active militia of 10,000 gunmen, with an additional 25,000 in reserve — a larger force, the dispatch notes, than the city police. 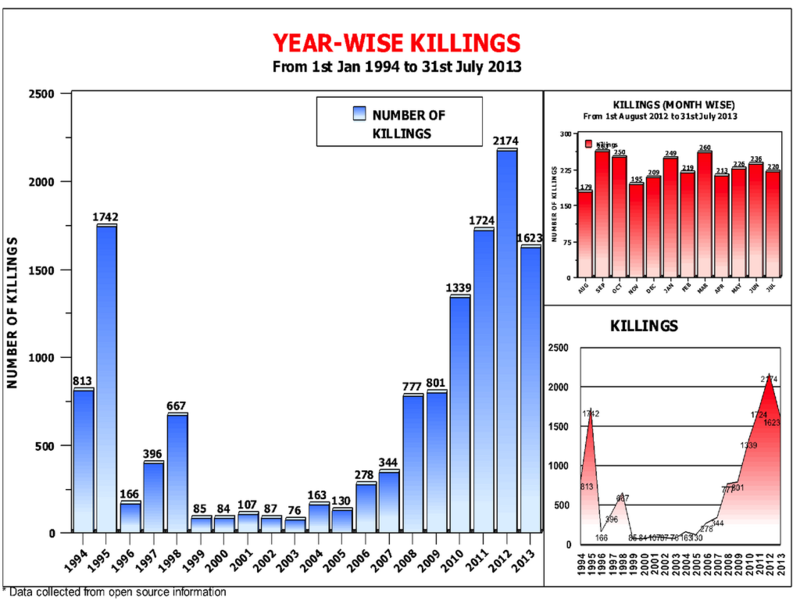 There was an organised effort to term muslim massacre as shia - sunni conflict even in Pakistan. Pakistani people showed lot of maturity and saw what was happening clearly and never played into the hands of the perpetrators. Shia Sunni have generally survived together with mutual respect for centuries, it is after the wahabi's state power got in play that the fitna is growing into monster with basically more of shia massacre. There are no shia sunni wars. hoping meanings of war are understood well and the term is not used so loosely. On going discussion is bringing out various perspectives and a lot of interesting concepts. Wasim: " Shia Sunni have generally survived together with mutual respect for centuries, it is after the wahabi's state power got in play that the fitna is growing into monster with basically more of shia massacre"
Shia-Sunni schism goes back to the 7th century. The Shia-Sunni violent conflict goes back to 15th century when the Safavids Shia dynasty took over Iran and forcibly converted the Iranian population which was almost 100% Sunni to Shia Islam. And then Baghdad and southern part of Iraq went through the same process. There was perpetual conflict between Sunni Ottomans and Shia Safavids and several wars. Many historians attribute Ottoman's inability to take most of Europe in the 16th century to the constant threat they had from the Safavids. During this period, there were Sunni massacres in Iran and Shia massacres in the Otttoman empire. Even today, Turkey and Iran are supporting opposite sides in Syria. It cannot be easy being Bashar al-Assad. Syria’s president has lost his brother-in-law, and some would say, his sanity to the civil war raging across the country. Yet, he continues butchering his people. Syria’s been ‘booted out’ of the Organisation of Islamic Cooperation (OIC), one of the many little wrist-slaps the regime has somehow survived. But at the OIC’s last emergency meeting, Assad found sympathy from unlikely quarters. President Asif Ali Zardari urged “a policy of non-interference” in Syria, then repeated himself in Tehran. In the routine outrage that followed though, commentators felt less strongly about Pakistan supporting the blood-splattered Assad than what several felt was a sop to Iran, Syria’s insurance in the Middle East. Whatever Pakistan’s motives, Iran is one of Pakistan’s most pressing cross-border headaches — even if no one likes talking about it. The careers of the fellow Islamic Republics have been diverging for a while. And whereas Pakistan’s foreign policy agenda is defined hazily at best, Iran is not nearly as conflicted about the role it seeks for itself in the world. It patronises Hamas, the Palestinian party running the Gaza Strip. It throws its weight around in Iraq, the prime minister of which took refuge in Tehran during the Saddam years. And it extends a veritable lifeline to Hezbollah, now a force to be reckoned with in Lebanon. Granted, Persian Empire 2.0 it is not, nor does Pakistan concern itself much with these states anyway (by itself a policy failure). But in places that Pakistan has bothered to create a stake for itself, like Afghanistan and post-uprising Bahrain, it quickly becomes evident that not only are the ‘brother countries’ on opposite sides, their proxies are also pitted directly against the other’s. That is not to say there is no potential for improvement. Pakistan and Iran are bound by historic, linguistic and cultural ties. Mahmoud Ahmadinejad’s fondness for cheap grandstanding commands a bizarre respect from the Pakistani street. Both sides remain committed to building the Iran-Pakistan gas pipeline, despite several stupid attempts at persuading Pakistan otherwise. But between Hezbollah, Assad’s Alawis, and the Shia-majority states of Bahrain and Iraq, most of Iran’s associates gel well with Tehran’s regional ambitions. By comparison, Pakistan’s credentials are not that good: armed with nuclear warheads, longstanding ties with Iran’s Arab archrivals and a series of ad hocisms in place of a foreign policy. This bleeds into what was always a confused relationship. In 2005, Iran’s nuclear chief coincidentally let slip that “pieces of centrifuges” were received from Pakistan. Pakistan has accused Iran of arming militant Shia groups operating in the country. And unlike the old days when the Shah would ply the original PPP regime with Cobra gunships — for mowing down Baloch tribesmen — today’s Iran blames Pakistan for ignoring Sunni outfits like Jundullah in Balochistan. Speaking to Reuters at a local football club, (Zafar) Baloch compared Karachi to a cake which attracted too many takers. "Right now we are sitting across the table watching the MQM eat the whole cake," Baloch said. "If this goes on, we will either ruin the cake for everyone or get our slice." The numbers certainly demand our attention. Of an estimated 5,000 to 10,000 foreign fighters in Syria, as many as 2,000 are said to be European nationals, as well as some 100 Australian citizens and several dozen American passport holders, according to published sources. While some are fighting alongside “moderate” rebel groups such as the Free Syrian Army, most have reportedly joined the ranks of the militant Jabhet al-Nusra and the formerly Qaeda-linked Islamic State of Iraq and Syria, or ISIS. I know the mentality of these nationless combatants. I fought beside them. As a teenage Afghan refugee living in Pakistan in the 1980s, I joined the anti-Soviet resistance. I took up arms in a cause we called jihad, or holy war — but one focused on liberating our homeland, not exporting an ideology. War came to us through Soviet invasion: We hated it, and we wanted to live through it to see a free Afghanistan at peace. Pitting a small, impoverished Muslim nation against an infidel invader, Afghanistan’s conflict attracted up to 20,000 foreign fighters in the 1980s, the largest contingent drawn to any Muslim country in modern history. Made up mostly of Saudis and Pakistanis, the army of volunteers also included Egyptians, Tunisians and Indonesians, among others. Make no mistake: The Afghan mujahedeen, equipped with Western arms, won that war. International volunteers played a marginal role in sealing our victory, their numbers notwithstanding. With an estimated 1,500 groups fighting in Syria, the conflict is clearly far more complex than the Afghan war. Europeans and Americans of Syrian heritage are fighting to liberate their homeland from the murderous Assad regime. Sunnis from Saudi Arabia and Libya have been drawn by their solidarity with coreligionists. In Afghanistan, hundreds of veterans stayed behind and followed in Osama bin Laden’s footsteps to later infamy. Others, gripped by religious fervor and martial wanderlust, went on to cause mayhem in places like Algeria and Egypt during the 1990s. But not all did, of course. For some, their adventure concluded, quiet civilian lives beckoned. I befriended a young Arab-American from New York who was happy to be heading home at the end of the war. A Harvard-educated British convert I knew went on to become a distinguished war correspondent. I, too, became a writer and journalist. You might say that in the end, we were more closely allied in peace than we had been in war. LONDON — Pakistan’s troubled criminal judicial system has failed to prosecute several notorious figures living there over the years, including Hafiz Saeed, the militant leader with a $10 million American reward on his head, and Osama bin Laden. But Pakistani justice has not been hesitant with Musa Khan, a 9-month-old boy who faces charges of attempted murder and whose relatives have spirited him into hiding. In a case that has heaped ridicule on the under-resourced police force, the baby boy was charged alongside four adults in connection with a violent protest in a Lahore slum in February. Slum residents threw stones at gas company workers who had tried to disconnect households that failed to pay their bills, leading the police to charge an entire family with attempted murder, including Musa. The absurdity of the case became apparent last Thursday when the screaming child was produced in court, and had to be comforted with a milk bottle as a court official recorded his thumbprint. “He does not even know how to pick up his milk bottle properly — how can he stone the police?” his grandfather Muhammad Yasin said to news service reporters outside the courthouse. On Tuesday, Mr. Yasin said the family had moved the child to nearby Faisalabad for safety reasons, citing “pressure” from the authorities. The case has attracted ridicule in the news media and provided fresh fodder for critics of the country’s dysfunctional judicial system, which frequently appears to suffer from misplaced priorities. Crude police tactics played a central role in the prosecution of Musa, who was charged in February alongside his father and grandfather following the attack on the gas company workers. Lawyers say that the Pakistani police often lodge exaggerated complaints against poor families as a form of collective punishment. The matter is likely to be quickly dropped. Shahbaz Sharif, the chief minister of Punjab Province and brother of Prime Minister Nawaz Sharif, has ordered an inquiry into the incident. The judge in the case has ordered the police to produce an explanation for the charges. The child’s lawyer has argued that children under the age of 7 cannot be prosecuted under Pakistani law. Musa remains free on bail until his next hearing, scheduled for Saturday. IN THE summer of 2007, things were not looking good for Maulana Abdul Aziz, an extremist cleric who had just failed in his attempt to impose strict sharia law on Pakistan’s capital by force. His Red Mosque and madrassa complex, a stone’s throw from government buildings in Islamabad, was stormed by security forces on the orders of then-president, Pervez Musharraf. Dozens of people died during the siege. Mr Aziz was caught trying to escape dressed in a burqa. He has his freedom thanks to the government’s tolerance of radical Islamists in national affairs. In February Mr Aziz was among five people nominated by the Pakistani Taliban to represent its interests in peace talks with the government. Although he soon dropped out of the process, the question of how much the country should adjust its constitution to suit its militant tormentors became a routine topic on talk shows. Mr Aziz says he is not part of the “armed struggle”, but he argues that violence is justified in order to establish God’s laws. He is revered by terrorists for whom the Red Mosque affair was a defining moment. One militant group—Ghazi Force—is named after Mr Aziz’s brother, Maulana Abdul Rashid Ghazi, who was killed during the siege. Some suspect the group may have been behind the suicide attack in Islamabad on March 3rd. Among the 11 dead was a liberal-minded judge who outraged extremists last year when he rejected a petition for Mr Musharraf to be tried for ordering the raid on the Red Mosque in 2007. A religious school for women in the Pakistani capital Islamabad has renamed its library in honour of slain al-Qaeda leader Osama bin Laden. The seminary is run by controversial hardline cleric Maulana Abdul Aziz, the imam of the city's Red Mosque, once notorious as a hideout for hardliners with alleged militant links. The mosque was the scene of a week-long military siege against radicals in 2007 which left more than 100 people dead and unleashed a wave of Islamist attacks across Pakistan. ..The chief cleric of the Red Mosque, Maulana Abdul Aziz, has inserted himself into the argument with a typically showy gesture: the inauguration of a new library named after the slain founder of Al Qaeda. Today, Mr. Aziz delivers thunderous Friday sermons from the lavishly refurbished Red Mosque, a stone’s throw from the Parliament building. And he oversees a network of madrasas that teach 5,000 students. Only seven years ago, the mosque was in the throes of a pitched battle against the authorities. Mr. Aziz tried to escape the siege under the cover of a burqa, a purse clutched in his gloved hands, but was captured and paraded by the intelligence services on national television, still wearing the black cloak. Malik Riaz Hussain, a sympathetic property tycoon, provided a temporary home for hundreds of madrasa students and spent at least $150,000 on refurbishing the bullet-pocked mosque. He attributed his generosity to pragmatism rather than to religious conviction. The city provided land worth millions of dollars in central Islamabad for the rebuilding of Jamia Hafsa, a women’s madrasa that was bulldozed after the 2007 siege. The madrasa, whose construction is not complete, is home to the Osama bin Laden library. But it is the courts that have been most indulgent toward Mr. Aziz and his followers. Over the past year, judges have dismissed all of the 27 criminal charges against Mr. Aziz, who at times has used the courtroom as a pulpit to call for the imposition of Shariah law. At Jamia Hafsa, Mr. Aziz has named a dispensary after Aafia Siddiqui, a Pakistani woman who is serving an 86-year prison term in the United States on charges of attempting to kill an American soldier and an F.B.I. official in Afghanistan. The Red Mosque has also staged a comeback on the Internet: Its Facebook page is named after the 313 Brigade, a fearsome band of armed female students that conducted raids on suspected brothels and video stores in Islamabad in 2007, in the months before the siege. Pakistani security agencies have reportedly warned the government that the resurgence of Lal Masjid cleric Maulana Abdul Aziz, who is believed to have links with militant groups and is known for his anti-government rhetoric, poses a security threat to the law and order situation in the capital city of Islamabad. A report entitled, "Activities of Maulana Abdul Aziz," forwarded to the interior ministry by the country's primary intelligence agency, accused the "Lal Masjid mafia" of having links to militant groups and land grabbers. It also claimed that Aziz was reorganising the Ghazi Force militant group, spawned by his followers after the Lal Masjid Operation, reported the Dawn. Along with religious institutions like Lal Masjid, grassroots social services organizations and informal networks of patronage also function as a surrogate welfare state to the country’s most needy. Pakistan’s most famous non-governmental charity organization, the Edhi Foundation, operates not only boarding schools, but also a huge fleet of ambulances and hospitals funded entirely by private donations. But for a country of 180 million people, such services are still inadequate, and many children end up panhandling on the streets or working in atrocious conditions in the country’s makeshift brick kilns and factories. For girls, families resort to marriage in the absence of other opportunities. In the film, 12-year-old Zarina is married off to a local boy by her reluctant parents after her village school is shuttered. For families faced with such choices, sending a child to a distant madrassa can seem like the most benign option, albeit one they seldom understand the full implications of. Among the Believers portrays Pakistan as a country in the throes of a clash between atavistic religious forces on one hand, and progressive, secular reformists on the other. The extremist figure of Abdul Aziz Ghazi is contrasted with that of Pervez Hoodbhoy, a nuclear physicist and spokesperson for the country’s liberal intelligentsia. But while this ideological divide is relevant, it is perhaps too simplistic to understand the country’s predicament. Although the Lal Masjid is an infamously malign presence in the country’s body politic, not all Pakistani madrassas are created equal. In the Karachi neighborhood where my extended family lives, a local school attached to a mosque offers religious instruction, as well as tutoring in science, mathematics and other subjects. Such schools, technically religious in nature, are not unique, and offer one of the few pathways toward a better future available to the overwhelming majority of Pakistan’s urban poor. While poorly regulated institutions are not ideal, they still offer some semblance of upward mobility through education in the absence of the state. Endemic corruption and an overbearing, largely unaccountable military establishment have, on the other hand, siphoned away funds which could otherwise be used to build sustainable schools with standardized curriculums throughout Pakistan. Until this problem is addressed, huge numbers of children will still be forced into early adulthood by work and marriage, and institutions like Lal Masjid will still be able to find a steady supply of children to indoctrinate into their radical worldview. d a man who shot and killed the governor of Punjab province over his call to reform the country's strict blasphemy laws, which carry a death sentence for insulting Islam, police and television said. Authorities nationwide were on alert in anticipation of protests by those who consider Mumtaz Qadri a hero who defended Islam with the killing, Geo TV reported. "At 4:35 a.m., Qadri was sent to the gallows," a senior police officer told Reuters by telephone on Monday. He requested anonymity because of the controversy surrounding the case. MEERUT: The first ever bust of Nathuram Godse - Mahatma Gandhi's assassin- was installed and unveiled by the members of Akhil Bharatiya Hindu Mahasabha at their Sharda road office in Meerut on the occasion of Gandhi's birthday on Sunday. The statue, which had drawn controversy in December 2014, was finally erected as the members of the Hindu outfit also observed Gandhi's birthday as 'Dhikkar Divas'. Detailing, Pandit Ashok Sharma, national vice president of the outfit, said, "In 2014, when we had tried to install the bust of Godse after a foundation stone laying ceremony. It was opposed by police and right-wing outfits due to which the spot was sealed and the matter was taken to court. This time, we exercised extreme caution and unveiled the statue on Gandhi Jayanti - as there can be a no better day. Our step signifies that it is time all Indians stop following Gandhi's footsteps and start worshipping Godse." The two-feet high and two-feet wide stone statue of Godse, made by artisans in Jaipur, weighs 50 Kg. It was brought to Meerut office by Yogendra Verma, Akhil Bharatiya Hindu Mahasabha's UP unit president. A shawl and a garland were presented to Godse's bust by the members after it was unveiled. It is no coincidence that the Yitzhak Rabin Center for Israel Studies stands deserted, while on the soccer fields, the murderer is cheered and the victim is booed. The real Rabin legacy should be sought on the soccer fields, in the classrooms, the outposts, the yeshivas, among the secular, the religious and the traditional; in fact, everywhere in the country where - according to surveys - 38 percent of the religious public view Yigal Amir as a hero. The Rabin legacy is in fact the anti-Rabin legacy. At the present time, ahead of talks with the Palestinians, the legacy will be updated to become an anti-Olmert legacy. Facing the Supreme Judicial Council (SJC) proceedings for alleged misconduct, Islambad High Court (IHC) judge Shaukat Aziz Siddiqui has challenged the decision of SJC. The SJC had refused Siddiqui’s plea to have an open trial instead of in-camera proceedings. Petitioner Shaukat Aziz Siddiqui, with the help of Makhdoom Ali Khan, Advocate, and Hamid Khan, Advocate, has filed a constitutional petition in the apex court under Article 184 (3), making the SJC and the Federation respondents. In his petition, the judge has requested that he should have an open trial instead of in camera trial. The petitioner had made the same request to the Supreme Judicial Council but that was rejected on May 18th. When former president of Supreme Court Bar Association, Asma Jhangir, was asked to give her views about this matter, she said that even though there was no room for open trial of any judge inthe SJC, but Justice Shaukat was still pleading for an open trial. What’s wrong with an open trial in SJC particularly if the petitioner is asking for it? Asma asked saying that was the reason for her advocacy of the petitioner's request. On the other hand, Hafiz S A Rahman Advocate said that in the past all the proceedings of the SJC were held behind closed doors. He said historically there never has been an open trial. However, he emphasised that the petitioner had taken the services of some of the best lawyers of the country and after analysing all aspects of this situation the lawyers have advised to use Article 184 (3). Barrister Gohar Ali Khan was also of the opinion that there was no mention of open trial in the rules and regulations of Supreme Judicial Council. A member of the Islamabad High Court Bar Association (IHCBA) Syed Javed Akbar, through his counsel Riaz Hanif Rahi, filed the reference before the SJC accusing the incumbent judge of “misconduct”. Justice Siddiqui had made an unexpected appearance at the IHCBA General Body Meeting (GBM) on November 10 and sought permission from the lawyers’ representatives to address the bar. The organisers allowed him to address the meeting, but only in his capacity as a former president of the Lahore High Court Bar Association, Rawalpindi Division. In his address, Justice Siddiqui said that the complainant had done his job after filing a reference before the SJC against the Islamabad High Court’s Chief Justice, Muhammad Anwar Khan Kasi. However, he suggested that instead of demanding an ‘immediate’ resignation, the lawyers should wait for the SJC’s final decision. In the reference filed on Thursday, the petitioner maintained that the judge was on judicial duty at the time he ‘interfered in the affairs of the bar’ and it was expected that he would preserve the dignity of his court and not involve himself in a public controversy. A legion of Islamabad lawyers had called the GBM wherein they reiterated their demand for the resignation of IHC’s top judge.